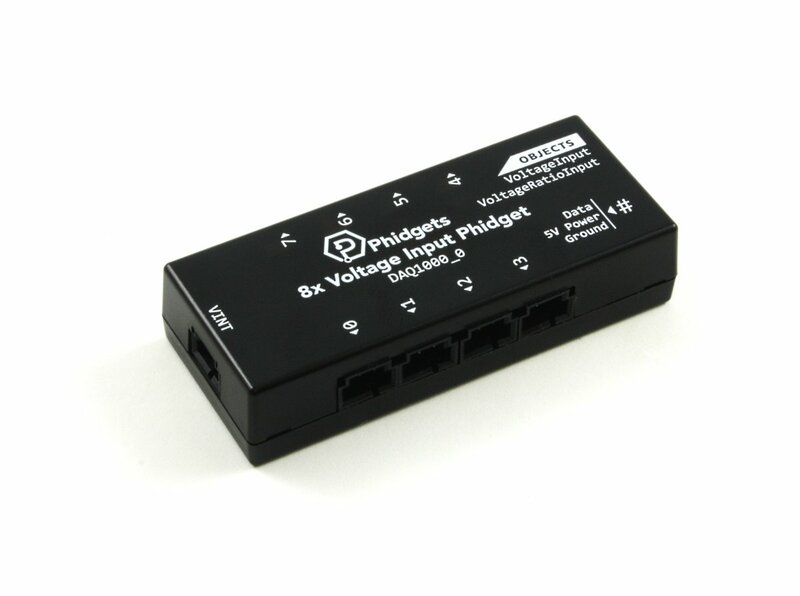 For applications where you just need a lot of sensors, the 8x Voltage Input Phidget adds eight 0-5V analog inputs to your VINT Hub. 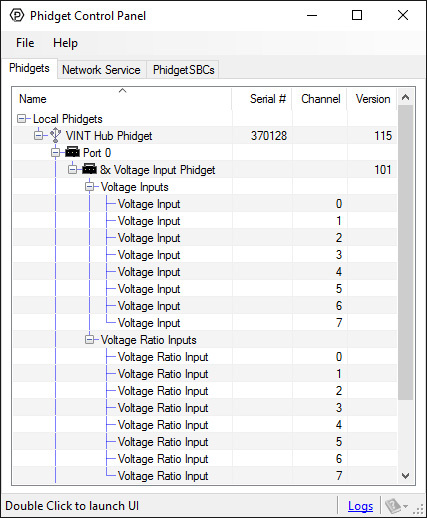 (See the Connection & Compatibility tab for a list of Hubs) Each input can be used in one of two modes: VoltageInput or VoltageRatioInput. 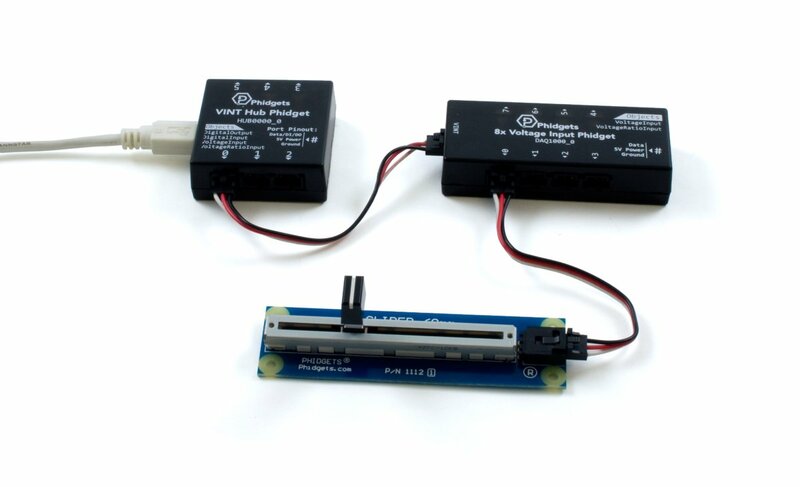 With VoltageInput mode, you simply measure a voltage value from 0 to 5V. This mode is useful for interfacing 5V sensors and for monitoring small voltages. In VoltageRatioInput mode, you can read ratiometric sensors like potentiometers and voltage dividers, whose output voltage depend on their input voltage. The return voltage is expressed as a ratio of the return voltage to the supply voltage from 0.0 to 1.0. You can change the sample rate of each input separately, to speeds of up to 50 samples per second. You don't need to worry about messy power cables either; Power from the attached VINT Hub is distributed to each input's sensor. 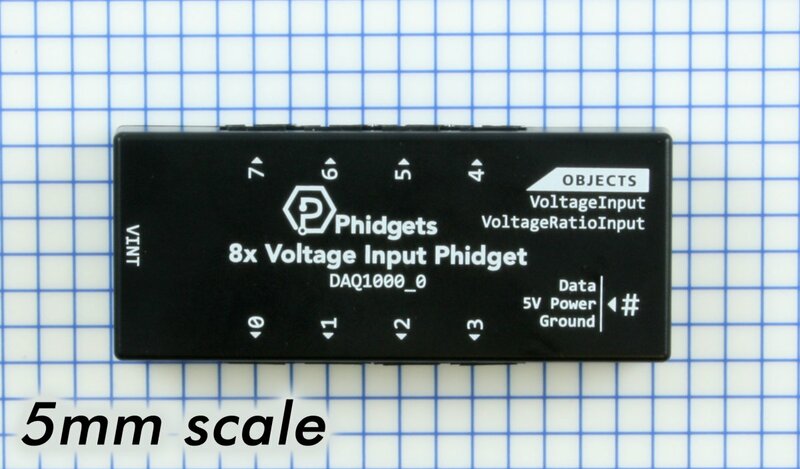 Conversion from sensor voltage into the units being measured is handled by our libraries when using sensors from Phidgets. Just set the SensorType property and use the SensorChange event and the conversion formula will be automatically applied to all incoming data. See the API tab for more details. If you're looking to precisely measure a smaller voltage or need power isolation between your VINT Hub and your voltage sensor, take a look at our isolated voltage sensor boards on the "Other Voltage Inputs" tab. Use a Phidget cable to connect this device to the hub and to connect sensors to this Phidget. Each analog sensor will come with its own Phidget cable, but if you need extras we have a full list down below. You can solder multiple cables together in order to make even longer Phidget cables, but you should be aware of the effects of having long wires in your system. * Varies depending on number of attached sensors.